I just thought of something. It’s kind of funny to me, because this has never crossed my mind before. And I only thought that it was strange that I hadn’t thought of it before. So here it is: What if I started training the way that I am now, when I got out of college? That would have meant that I never stopped working out, but that I took what I now know about training and nutrition and implemented it. What if I started living a healthy lifestyle back then? If I had continued to be active and made some changes to my training so that I would meet my current goals earlier, than who knows what kind of shape I would have been in for the last 26 years. Who knows what I would be doing. I’m sure it would have had quite an impact on my life. But no matter what, I would not want to go back and change it. I’m actually glad that I didn’t live a healthy lifestyle my entire life. Being fat and out of shape was something that I needed. Maybe it sounds strange to you that I would say that. You might wonder why, I’m glad that at one time I was so out of shape that a doctor told me that I was going to pop. I’ll tell you why. It’s because I overcame certain challenges to get to the point in my life that I am at right now. It wasn’t easy. In doing this I was able to strengthen my mind. I was able to learn how to control myself. I am also able to put myself in other people’s shoes and understand what they are feeling and I know what they will have to go through to reach their goals. At one time I was in someone else’s shoes. Sometimes it seems like it was a dream. I remember the person that I was but it doesn’t seem real to me. I have learned so much more in these last 3 years then I have during the rest of my life. The reason for it is only because of what I put myself through to get here. A lot of the things that I have learned are about myself and it helps me relate to other people. From my point of view, most of the things that I learned, could only be learned coming from a miserable place. What I mean by that is that I had mentally put myself in a place that was full of misery (lack of goals, drive, determination and confidence. And an abundance of depression and negative thoughts.) I was able to dig myself out and end up on the polar opposite side. If I hadn’t faced any of these challenges, than I probably wouldn’t appreciate what it took to get there. More than likely I would be a cocky prick, who may understand what hard work is, but doesn’t realize what people go through when facing tougher challenges or for that matter any challenges. I would probably take the things that I had for granted and feel entitled. I still don’t have everything figured out and I am constantly learning. I am also increasing my goals. If I ever become satisfied I might just fall back into my old ways. I need something to drive me. One of those things is passing on what I have learned to others. It’s only fair, because I constantly get knowledge, motivation and inspiration from others. Posted in My Transformation and tagged bill phillips transformation, fat and out of shape, fat happy and jolly, healthy lifestyle, set goals, strengthen mind, transformation. Bookmark the permalink. Looking Back On My Transformation Was It Really That Hard? One day I made the decision to transform my body. I ended up transforming my life. I look back on it now and some times think that it really wasn’t all that hard to accomplish. What makes me think that? I’ve learned a lot since I surpassed my original goal. Most of what I have learned has been about myself. The greatest thing that I learned was being able to take control of my mind. That truly is the hardest part. If you can control your mind, you can control how and what you eat. If you can control your mind, you can also train several days a week. If you can control your mind, than you can give up what is holding you back. If you can control your mind you can clearly see your goals and you can reach them. Don’t get me wrong, I am not saying that it is easy. And I am not saying that you can just convince yourself that you will live a healthy lifestyle and have a fit body. It does take time and if you are like me, you will probably expect more from yourself. You may have setbacks and you may have to convince yourself that you are strong enough to control your own mind every day. What was once impossible can now be accomplished once you take control of your mind. The hard part is being strong enough to be able to take control of your mind. Posted in My Transformation and tagged bill phillips, control your mind control your body, healthy lifestyle, reaching goals, taking control of your mind, transformation. Bookmark the permalink. Rich (one of my buddies who has been training with us) tried working out with me and Chase Reynolds (RB – St Louis Rams) a while back and had a big problem hanging with us. We busted his balls every day after that and he refused to try it again. This was after he watched us for weeks and decided that, “Oh that’s not so hard. I can do that.” He actually showed up at the gym and came over to us and says, “I’m going to workout with you today.” We said ok and jumped into a single exercise, which we rarely go with. One solo exercise, not a circuit not a superset. It was a chest bounce exercise with no weight (We are in a plank position – push up position. Workout bands around the hands looped through a squat rack behind us – causing resistance. Hands are on separate platforms. We bounce on hands and feet from one end of the platform to the other. 10 bounces each direction. This is done several times non stop.). Next we did 4 or 5 rounds of a 4 or 5 station circuit, nonstop. Rich didn’t like hearing the words nonstop. When we finished he looked out of it and he said he was going to get some work down. Chase said, “Are you kidding? Are you done?” I said, “Rich, this w as a light workout and we aren’t even a quarter of the way done.” That simple workout was enough to make him decide that it was not for him. Well I guess it stirred something in the back of his head, because a few months ago, he started working out with me and the other guys. This dude has come a long way. His workouts were pretty similar to what I did before working out the way that we currently train. (Now: No rest, lots of reps, 4 or more rounds, lots of functional movements, and lots of core. We beat down the same muscles over and over again in our workouts. We work a lot with increasing muscle stabilizers and muscle endurance.) (Before – Mixing heavy weights and also adding some High Intensity Interval Training (nothing like the HIIT that we do now). Rich decided that he wanted to challenge himself and has been coming in with us and improving every day. Not bad for another guy in his mid 40’s who never trained this way. It’s not like he has to train this way. When asked why he does it, he said, that he wants to be in better shape (he was already in “good shape” based on what he thought) and he likes challenging himself. 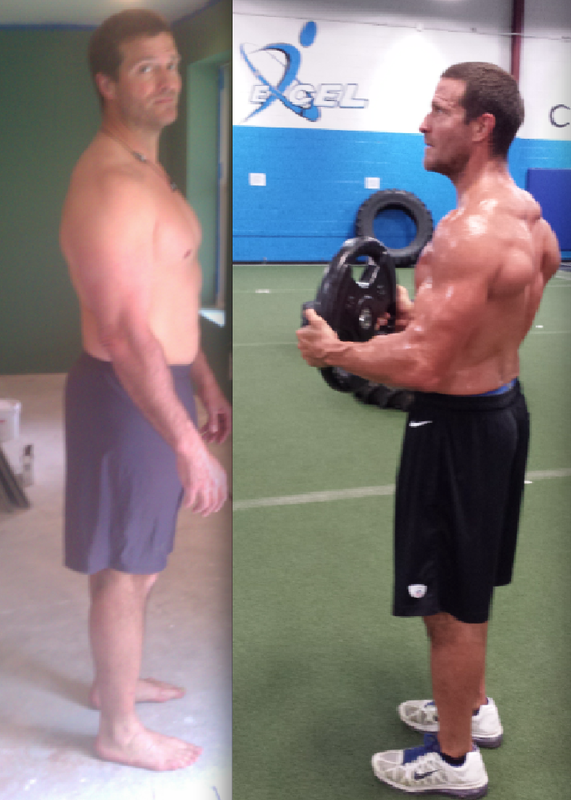 Our training has not only gotten him into better shape, but has help him get rid of back, shoulder and elbow pain. I love finding his weak spots, just to make him suffer. His suffering will be gone soon, since he is improving every day. Like I said he really has no reason to train the way that we do and honestly neither do I. We are around the same age and both of us come from athletic backgrounds. Both of us also went through our own transformations and both of us like helping other people achieve theirs. Since he is one of the owners of Excel Training (the gym where I train), he is involved with changing all kinds of people’s lives. Helping people live healthy lifestyles and kids train to be better athletes. Now that he is one of my training partners, he joins me in putting college and professional athletes who are half of our age in a form of torture that only helps them improve. A big part of our workouts are psychological. Push yourself harder, push yourself further. Our reason for training this way: We have the satisfaction of being able to compete on a daily basis with professional athletes (our workouts have a competitive nature tied into them). We Challenge ourselves every day. We can prove that if you BELIEVE it, that you can do it. We take pride in being able to do something a lot of people would walk away from. We take more pride when one of those people who does walk away comes back and FINISHES WHAT THEY STARTED!!! When we train, our entire group is constantly motivating each other, but we also talk a lot of crap to each other. If you come in last in something or you mess up somewhere along the line, you will hear about it. Rich is probably the most fun person to pick on. No matter what, I know it motivates him. I hear my fair share. Rich doesn’t know how to read, so if you know him, please don’t tell him that I wrote this. I will just deny it. Posted in Motivation and Inspiration and tagged can i get in better shape?, chase reynolds, healhty lifestyle, healthy lifestyle, how do professional athletes train, upgrading your training. Bookmark the permalink. I have to give credit to my training partner Chase. He says that if I steal anymore of his ideas, then he will sue me. Mix all of the ingredients together in a mixing bowl thoroughly. Take spoonfuls out and roll into balls. Helps with digestion and good for cardiovascular system. 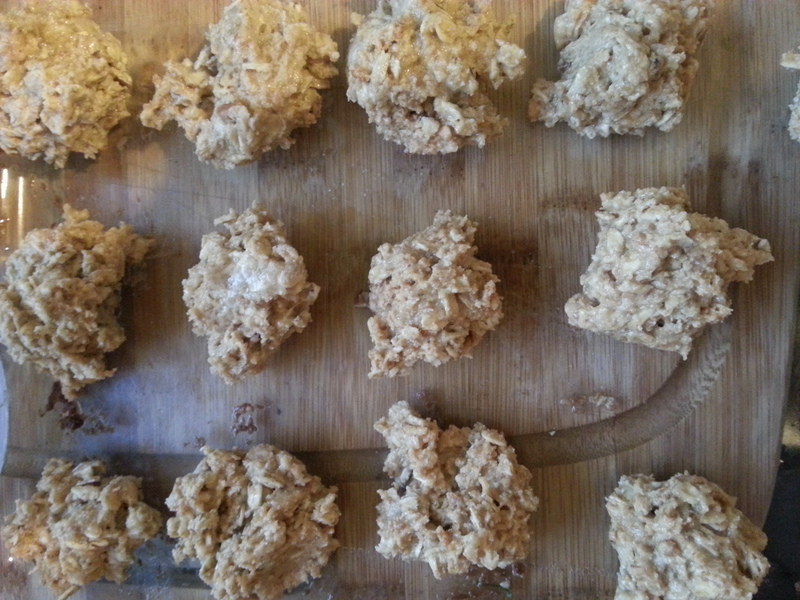 Posted in Recipes For Evolution and tagged healthy junk food, healthy lifestyle, healthy recipe, protein balls, salty balls. Bookmark the permalink. Inspired By Mom: Where Did You Get Your Drive And Determination? Not long after my mom committed to participating in the Senior Olympics, she called me to tell me about her adrenaline rush during her training. She talked about this amazing feeling that she had while swimming and thinking about her competition. It’s one thing to go out and get involved in an athletic activity but it’s another to compete or prepare to compete. When you visualize going up against your competitors and pulling away for the win or reaching your goals it’s amazing how much that can motivate you. It’s a feeling that I love to get and hearing her talk about it makes me proud of her commitment. She has always challenged herself. She was swam mostly in order to stay fit and relax, more than anything. I’m sure when she first started, it was so that she could get away from 3 rowdy kids (me and my brothers) for a little while. A couple of years ago she took a Gold in the Maryland Senior Olympics and did it again this last year. As I write this she is going on her second day of the National Senior Olympics. Her events are 100, 200 and 500 Freestyle. The only thing that makes me realize that she is 81, is that when referring to “Freestyle”, she says, “I’m doing the Crawl”. She came to most of my football games, wrestling matches, swim meets, soccer games and plenty of other stuff. She even comes to our annual Turkey Bowl sometimes so that she can watch a bunch of old guys run around and pull hamstrings. She has always been my biggest supporter. It’s about time, that I came out to see her compete. I’d have to be an idiot, not to realize that I am who I am today because of her. I definitely have to acknowledge my dad for instilling hard work and many other things into me, but this blog is about my mom. Anyway, I remember being asked, “Who are your “Heroes”?”, when I was younger. I would think about it and come up with some guy who played in the NFL, that I had no connection to, other than watching him play on Sundays. Watching a talented ball player can definitely build motivation, but if I don’t know someone than they probably won’t be a “hero” to me. I still may respect them and appreciate what they do. There are a few people who I actually would consider “Heroes” to me and a couple of them are professional athletes that I personally know. For me it is about more than what they do on the field. It’s about how they prepare and commit. These guys give it their all and then they give the other 10%. They make a Promise to Fail in order to get better. But they also promise not to Quit. They are also the same guys who go out of their way to help others. It’s not “all about them.” Well, when it comes to “Heroes” I can’t rank these guys as high as my mom. Being Inspired and Motivated by her has strengthened many of my qualities: Dedication, Determination, Persistence, Heart, Commitment, etc… She taught me to know what it takes to Win, to Succeed. She was also ahead of her time when it came to nutrition. And she has always been fit and active. My brothers and I grew up playing sports year round as well. She participated in running, tennis and swimming. Not only that but she was living a healthy lifestyle before a healthy lifestyle was “IN”. Most of our meals were home cooked and they almost always contained a protein and a carbohydrate along with vegetables. We had a salad with homemade dressing (usually a vinaigrette) with our dinner every night. Most of our meals were as a family at the table. Fortunately, my mom is a great cook. Enjoying good food everyday, is probably why I also learned how to cook great tasting food. My mom would also always make us bag lunches for school. Peanut Butter and Jelly sandwiches were our typical lunch along with a piece of fruit. On occasion my dad would make lunch for us, if my mom was not around. We learned very quickly that it was a big mistake letting him make it. He would tend to get very creative with his sandwich making ability. His favorite was a Peanut Butter, Butter and Jelly sandwich. And no that wasn’t a typo and I didn’t stutter. He really would add Butter to our Peanut Butter and Jelly sandwiches. And it would be a huge hunk, which he would place in the middle of the sandwich. There is nothing like enjoying your Peanut Butter and Jelly sandwich and then all of a sudden, you bite into it and are surprised by biting into a huge lump of butter. I like butter but not a huge piece on my peanut butter and butter and jelly sandwich. I would gag on it. I literally almost puked. And as a stupid kid it took me a while to figure out that if dad made lunch open the damn sandwich up and remove the stick of butter that he tried to choke you on. How the hell would I be surprised by this every time. It must have happened at least 10 times before I learned. Either that or it happened once and it was so traumatic that it turned into a few hundred times. If you want to torture your kids try it out on them. When I was about 9 years old and my brother David and I went shopping with our mom. As she was walking down the aisle, picking out healthy food to bring home, we were grabbing all kinds of crap and throwing it in the cart. As soon as it would land mom would take it out and put it back on the shelf and say, “Additives and Preservatives. Additives and Preservatives, that’s all that these are.” We really didn’t know what those big words were but had assumed that they were bad. They sure as hell tasted good. The words just sounded funny to us. For the next couple years we would mimic her out of the blue. “Additives and Preservatives”. It still comes up once in a while. Talk about something being etched into your brain. I guess I’ve got additives and preservatives carved into my mind. I can’t walk down certain aisles in a supermarket without thinking about that. This is a good thing. All of my friends were impressed by how athletic my mom always was and they would talk about how athletic she was…Actually they still talk that way. Growing up hearing others talk about her definitely made me proud. Even prouder that she is still doing it. 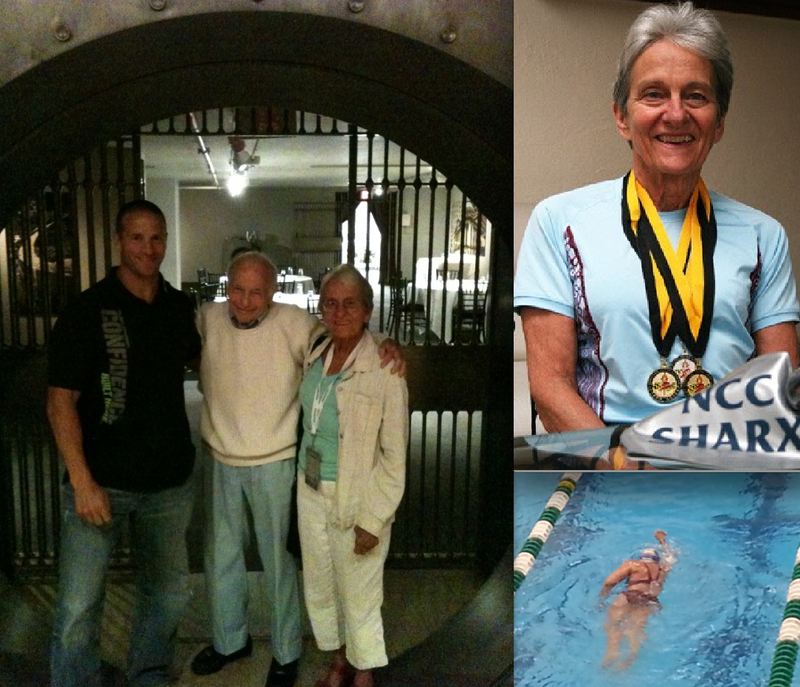 As my mom got older she cut out the running and cut back on the tennis, but swimming has been a great exercise for her. It’s great to see her take it to a competitive and challenging level. 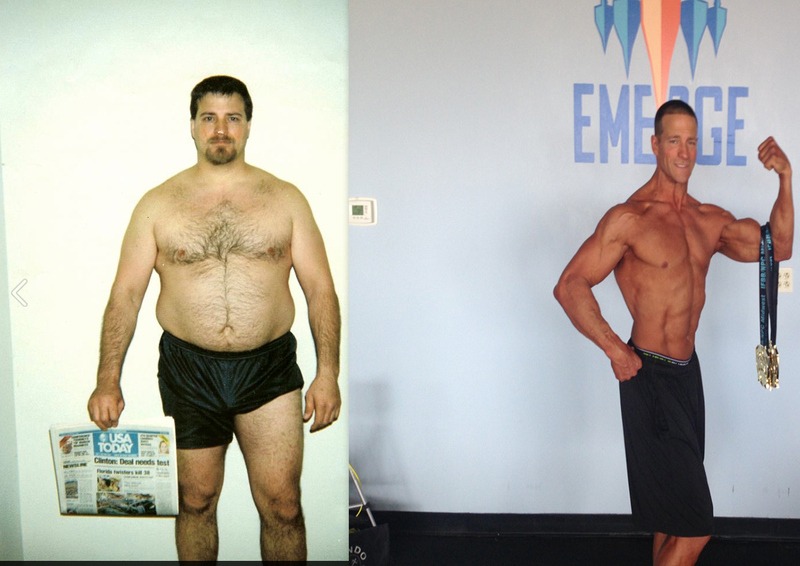 For 20 years I missed out on competition and most physical challenges. Getting myself back into that is the best thing that I have ever done. I did that at 45. Seeing my mom do it in her 80’s (she turns 82 in a few weeks), is amazing. Posted in S.W.I.M., Uncategorized and tagged 80 and athletic, challenge yourself, healthy lifestyle, inspiration, it's never to late to train, it's never to late to workout, it's never too late to compete, senior olympics, who inspires you, who is your hero. Bookmark the permalink. My training partner Chase was in South Park, Colorado and he met Chef. He got his recipe for Chef’s Chocolate Salty Balls. These things are awesome. 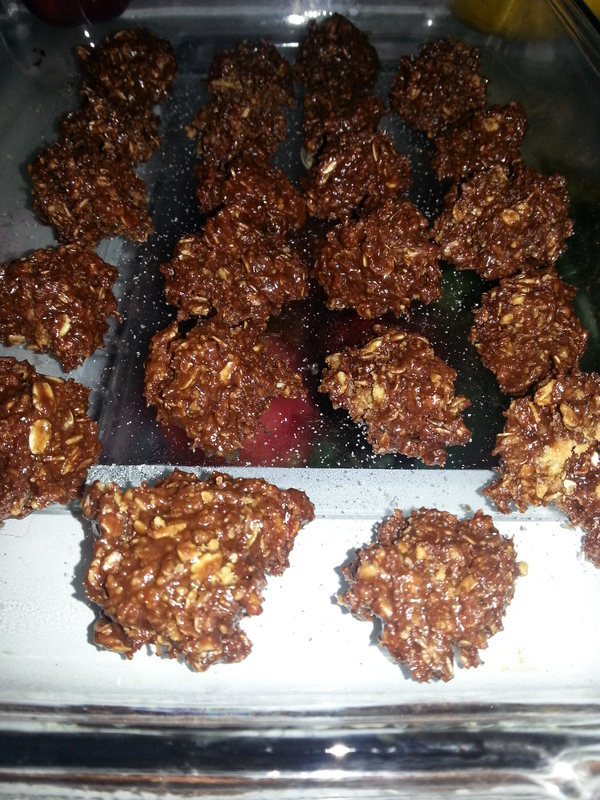 Posted in Recipes For Evolution and tagged Chef's Chocolate Salty balls, chocolate and peanut butter, chocolate salty balls south park, healthy chocolate recipe, healthy desserts, healthy lifestyle, healthy recipes, how do you make chefs chocolate salty balls, raw cacao recipes. Bookmark the permalink.